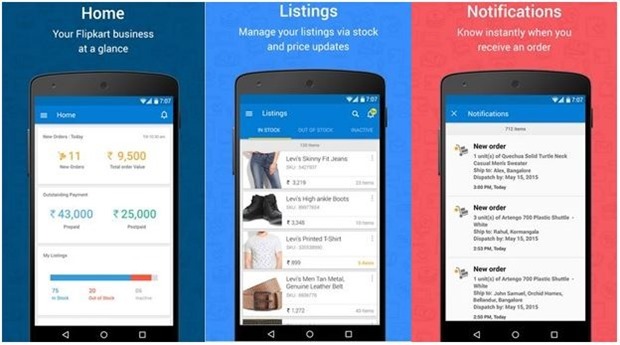 India’s leading e-commerce giant Flipkart has launched its mobile app named ‘Seller Hub’ for its sellers. The app is currently available on Google Play and can be used only after logging in via a Flipkart seller account. Seller Hub will enable 30,000+ sellers on Flipkart to manage their online business anywhere and at anytime. The sellers will also be able to grow and expand their business using their mobile devices as they will now get all data related to their listings, orders, returns, payments, and order fulfillments in real-time from this mobile app. Seller Hub while letting the sellers get real-time data about their inventory, orders, and payments will also let them reach out to 45 million Flipkart users on-the-go. “We are excited to announce the launch of ‘Seller Hub’ App. The app will offer sellers end-to-end visibility and enable them to enjoy a seamless selling experience. Focused at creating ease and convenience for sellers across the nation, this app will help sellers reach out to 45 million Flipkart customers on-the-go,” said Ankit Nagori, SVP-Marketplace, Flipkart. This mobile app aims to provide a level playing field to all sellers on Flipkart, whether they are from metros or from small towns. Flipkart hopes that the app will a huge in the market as more and more people are using their smartphones for getting online. And their sellers would definitely love to streamline their businesses using their mobile phones itself. “An extension of products and services offered to our sellers, this new app will offer an even playing ground for sellers from both metros and small cities. With smartphones becoming the primary device to access the internet, we are confident that this app will be a big hit amongst our sellers,” added Ankit. Interestingly, Amazon had launched their seller app in March this year, while Snapdeal had launched their app for sellers nearly an year back. With Flipkart too coming up with the app, all 3 major ecommerce companies have apps that will allow sellers to do their business on the move! Its Official, BSNL To Roll Out Free National Roaming from June 15; Full MNP From July! Sir i hav registered my self as men casual seller in flipcart but unable to proceed further plz help me out as soon as possible so that i will be sooner be part of one of the most loving ecomerece co.